As part of my VSAN Cluster that I’m building, I wanted to dig deeper and test hte LSI Host Bus Adapters. These cards have been used extensively in past few years with storage appliances that migrate the mangement, compute and error handling to the operating system, rather than to use RAID adapters. I have build various storage appliances using Nexenta Community Edition. Even as I speak, my office lab, is using such a Nexenta Community Edition 3.1.5 server, to provide shared storage to my vSphere 5.5 Cluster. I’ve used various LSI Host Bus Adapters in my Nexenta boxes, like the LSI SAS 9207-8i in my recent home storage, or the LSI SAS 9201-16i in my office storage. These are very reliable cards that I highly recommend. For the implementation of the VSAN in the office lab, I have decided to turn to the latest LSI SAS 9300-4i card, so that each of my Cisco UCS C200 M2 LFF host (4x 3.5″ Disk slot), can have a powerful & stable card. The LSI SAS 9300-4i is a PCIe Generation 3 card, but it works great in my PCIe Gen2 slot. The LSI SAS3004 Chipset, supports 12Gb/s SAS connection using an (x4) internal mini-SAS (SFF8643) HD connector. The card is affordable, and should be around $245 (as advertised on the LSI store). For servers with only four disk slots (1 SSD and 3 HDD), the LSI SAS 9300-4i is a nice fit, and provide futur usage. I added an Adapter HD-SAS Cable 2279900-R (Right Angled) to ensure, the cabling fits nicely in the 1U server. Here is a view of a Cisco UCS 1U server with 1 SSD (Intel S3700) and 3 Seagate Constellation CS 3TB hard drives. 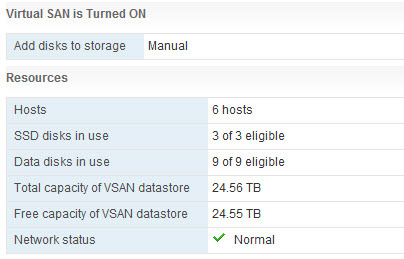 I think this kind of server is the right configuration for the VSAN building blocks. The interesting thing is that the LSI SAS 9300-4i presents the four devices in the ESXi (esx14.ebk.lab) host with a Transport Protocol “Parallel SCSI“, instead of the expect Block Adapter. 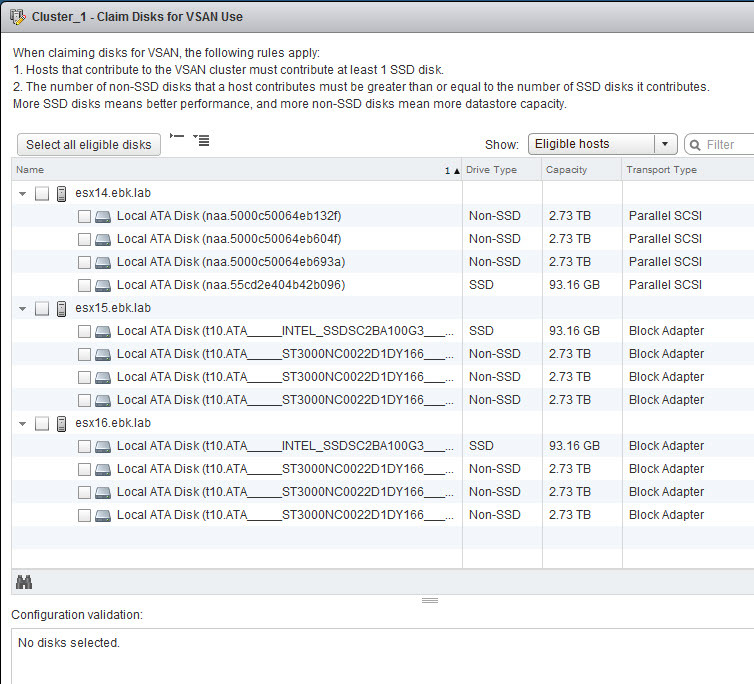 This has not stopped the claiming of the Disks to create a 24.55 TiB VSAN Cluster. I’m aware that the Intel S3700 are only 100GB, and are way undersizes by the amount of total storage provided in each hosts, but I just don’t have the budget for 400GB or 800GB Intel S3700. I might test this config at some point with Samsung 840 Pro (512GB) if I see that the VSAN Observer is reporting excessive Congestion or WriteBuffer Fills. It’s going to be interesting. At the time of the writing of this article, the AHCI bug identified in the VSAN Beta has not yet been fixed. This has contributed to the reason of my selection for the LSI SAS 9300-4i Host Bus Adapter. 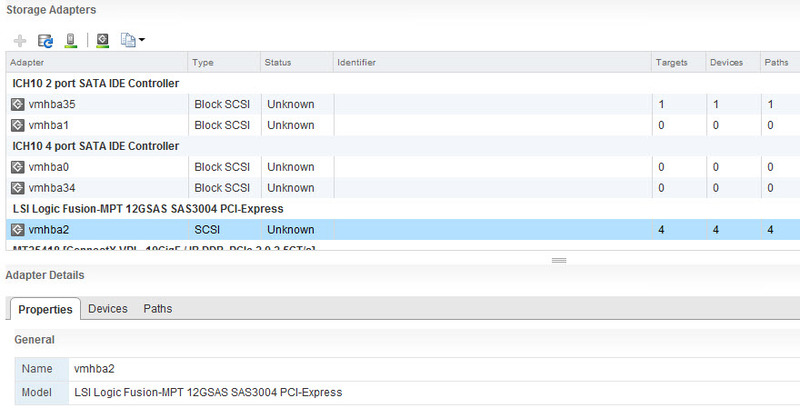 I have added the LSI SAS 9300-4i to the VSAN Community HCL.